Do you know what it’s like to live in paradise? I do, though we don’t take advantage of it as much as we should. But that changed this past holiday weekend. We headed south, just a little over an hour away (I spend more time in the car trying to get downtown! ), for an impromptu weekend getaway to the Florida Keys. 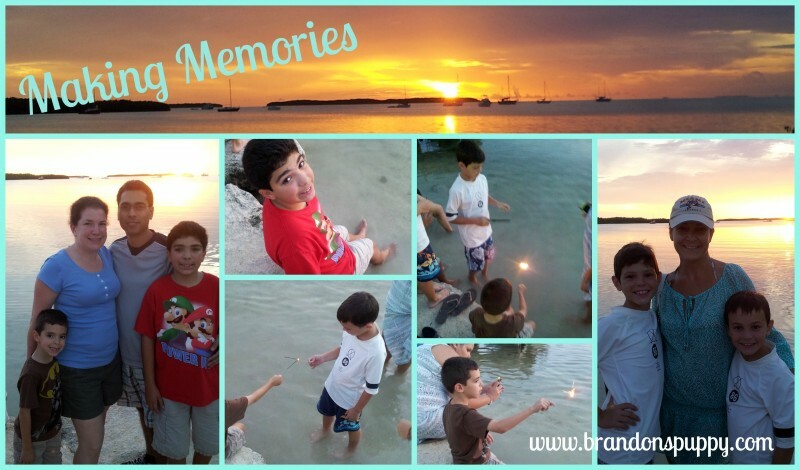 My dad, stepmom, her mom and brother, and my stepsis and her boys were staying in Islamorada for the long weekend, and we decided to join them on Saturday, once hubby got home from work. We were only gone for about 30 hours, but it was enough to relax and recharge. If you’ve ever been to the Florida Keys, you know that you can’t help but slow down once you’re there. I know I unwinded once we arrived just by smelling the ocean air and feeling the breeze on my face. We had an early dinner at Wahoo’s with my sister and nephews, and her boyfriend and his kids, and then headed to Lorelei’s to watch the sunset. It was spectacular! On Sunday, we all went to breakfast at Mangrove Mike’s which is adjacent to the hotel we stayed in. All of us left with happy bellies, ready for whatever adventures lay ahead. After a dip in the pool and some lounging, I thought we were calling it a day and heading back home, but hubby wanted to tag along with the rest of the group on their snorkeling adventures. He hadn’t been snorkeling in years, and I’d never done it (or the boys, for that matter) so we decided to join them. I’m so glad we did! Eric was so happy, and Brandon loved it! (Matty decided he’d rather watch us from the boat, so we took turns). It took me a little bit to get the hang of breathing just through my mouth using the tube, but once I did, it was great! The boat we toured with had noodles for us to float on, and that made it so much easier to just relax and check out the amazing scenes below us in the ocean. Before we knew it, our tour was over and the boat re-docked. We had to start heading home, but the traffic had other plans for us. We could see the Overseas Highway from the boat dock, and traffic heading back north was not moving, so we decided we might as well have an early dinner at The Hungry Tarpon and wait out the traffic having fun instead of sitting in the car for possibly hours. That worked out perfectly because by the time we were done, the traffic was flowing and we got home in no time. I am so happy we decided to join our family for this impromptu staycation. We needed the time “away”, and plan on doing it again soon. After all, paradise is just a few miles down the road! This entry was posted in Around Town, Family & Friends, Holidays, Life Happens, Travel. Bookmark the permalink. 4 Responses to We went on a Florida Keys Staycation and loved it! Thank you BB, we really must get away once in a while for our body, mind and soul’s sake! sounds like a great staycation! we need to get down there.